The Bauhaus design school has had a major influence on modern design. The movement it started revolutionised architecture, design and art like never before! What’s Up, Germany? pays tribute to the Bauhaus, which has left a legacy that is relevant even after 100 years. 1 In 1919, Walter Gropius founded the Staatliches Bauhaus in Germany. Operational from 1919–1933, this design school was located in Weimar, and later in Dessau and Berlin. Though Gropius was an architect who regarded architecture as the “ultimate goal of all artistic activity”, the school didn’t have an architecture department until 1927! 2 Gropius believed that design should serve the community. He wanted to form a new guild of craftsmen by getting rid of the barrier between craftsmen and artists, which he regarded as snobbery. The idea was to create a Gesamtkunstwerk or “total work of art” by combining fine arts and crafts. 3 The most basic principle of the Bauhaus school was form follows function. Ornamentation and clutter were discarded, while minimalism and utility were embraced. Buildings became modern and cubic. Products were designed with functionality and mass production in mind. Geometric shapes and primary colours took centre stage. 4 The school had several influential artists, architects and craftsmen in its faculty: Wassily Kandinsky, Josef Albers, László Moholy-Nagy, Paul Klee, Marianne Brandt, Oskar Schlemmer, Marcel Breuer, Gunta Stölzl, Herbert Bayer, Mart Stam, among others! Some of them began as students and went on to become masters, as teachers were called at the Bauhaus. During its short 14-year existence, it had three architect-directors: Walter Gropius, Hannes Meyer and Ludwig Mies van der Rohe. 5 The creative atmosphere at the Bauhaus attracted young people from all over the world. Apart from their talent, the students were known for their long, unkempt hair, androgynous clothes and wild theme parties like the Lantern Festival and the Kite Festival. What went on at those parties we shall sadly never know, but you are free to guess! 6 Though the Bauhaus was permanently closed in April 1933 by the Nazis for its modernist and democratic approach, its influence continued to spread. Its faculty members relocated to different countries, leaving the Bauhaus mark wherever they went. Gropius and Breuer taught at the Harvard Graduate School of Design. Moholy-Nagy started the New Bauhaus school in Chicago, which later became the IIT Institute of Design. Mies, who also moved to Chicago, became a celebrated architect. And Max Bill, a former Bauhaus student, opened the Ulm School of Design in Germany. 7 Germany is all set to celebrate one of the biggest cultural events of 2019: the centenary of the Bauhaus. Major exhibitions and programmes will take place across the country and the world over a period of three years. The three museums that were once Bauhaus schools in Weimer, Dessau and Berlin will be the shining stars. 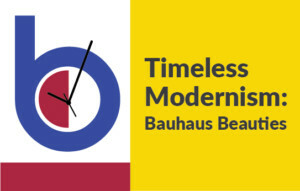 Do keep an eye out for Bauhaus events that will take place in India. 8 The affordable modular furniture that we love has been inspired by Bauhaus classics. Our favourite stores like Ikea and Muji also reflect Bauhaus’ influence. Their designs are modern, utilitarian and shorn of adornment, just as the Bauhaus masters wanted it. So, whether we realise it or not, Bauhaus continues to be present in our lives. Even Obama’s 2008 campaign had a Bauhaus-inspired poster to announce his arrival in Germany! 9 There was no real concept of graphic design before the Bauhaus. Type was more of an afterthought; the image was important. That changed with the masters of this school who used type as an essential element of design. Herbert Bayer invented the famous Bauhaus-style Universal font. 10 Gropius’ Bauhaus school building in Dessau, with its flat roof, glass facade, steel and concrete frame, will make you forget you’re looking at a structure that was built almost a century ago! It’s no surprise this architectural landmark was awarded UNESCO World Heritage status!